Arthur's Reading Games is the perfect combination of learning, fun, and helpful features. With 6 different fun-filled activities and 5 levels of difficulty, Arthur's Reading Games will entertain your child with hours of learning and fun! Join Caillou and his friends as they teach your child about colors and shapes. Play in English, Spanish, or French. Entertaining activities provide hours of fun and learning, and they're different each time you play! Blue Puzzle: Help Caillou see the picture by clicking all the blue pieces. Painting Green: Click all the green things in the scene Grandma is painting. Red Reveal: Help Caillou by clicking on all the red things in Grandma's studio. Shape Match: Click on a shape, then click on another shape that is the same to make a match. Discover the happy and colorful world of Reader Rabbit with your child. This program was designed and tested by learning specialists and parents. It's lots of fun and easy to use. With just a little practice toddlers can play the activities without help. The adventure starts in a creaky elevator hidden in the schoolhouse wall. Follow CJ the Frog and his sidekick Edison on a journey into their secret clubhouse. Use your math, science, grammar, and other skills to solve the many challenges found in 22 interactive games. Through fun activities and songs Jump Start® Phonics Read & Rhyme encourages your children to become confident readers by introducing, teaching, and reinforcing the basic building blocks of reading. Step-By-Step Approach: Children master each new word and sound as they progress through engaging activities. Vocal Recognition & Feedback: Kids can record and hear their own voice played back. Practice Vowels & Blends: Match up the letters and the sounds they make. Read-Along Songs: Read and sing new words as you follow along with 24 toe-tapping karaoke songs. 8 Skill-Building Activities: Learn over 200 words plus the 42 sounds of the English language. Team up with Blaster and G.C. to exterminate Dr. Zero's beastly computer bugs! Go straight to the heart of the galactic network, where you'll crack a code in the circuits, rewire them for sound, and navigate through the motherboard maze. Dive into an ocean of reading fun with G.C. and Max Blaster! Discover an undersea world of adventure as you learn about letters, sounds, spelling, phonics, stories, and more! The Mumbles have invaded Earth and hidden all the books! Use your reading skills to help Blaster, GC and Mel find the clues they need to recover the missing books. Use your 4th Grade problem-solving skills to unearth the secrets of the lost treasure map! Pack extreme fun and exciting adventure into learning as you find clues in caves, unlock hidden tunnels, and solve the mystery. Master skills in Math, Geography, Grammar, Science, and more! Kids Learn: Parts of Speech, Spelling & Vocabulary, Addition & Subtraction, Multiplication & Division, Prime Numbers, Fractions, & Decimals, Estimation,Science,Geography, Music, The Arts, History. The world is losing math knowledge by the second, and all signs point to evil Dr. Dabble! Help Rave get to the root of this dastardly plot! 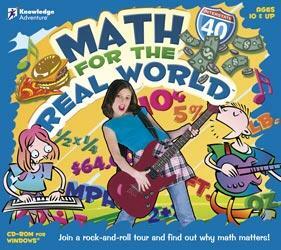 Hit the road with your cool new band and discover how much math plays a part in everyday life! Build key math skills as you manage money, buy food, use maps and more to help your band climb the charts. With Math for the Real World you can master all the math skills you need to succeed in real life! Six of Bizarroville's leading citizens have vanished into thin air, and all the evidence points to Dr. Dabble! Use your reading comprehension skills to follow the trail of letters, journals and clues to unravel the mystery! With the 25 lessons in this animated update of Type to Learn 3 students embark on time-travel missions to learn keyboarding skills. Typing tutors in our K-12 schools, have become the foundation of educational technology. It is very important to have quality typing tutors available for today's teachers to customize and track our students typing progress.